As a Sound Engineer, I get to see a lot of technical riders. Some are good, most are astonishingly bad. 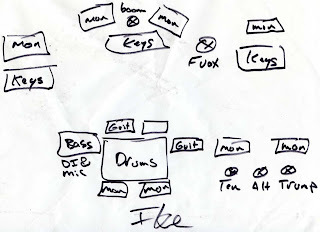 For those that don't know, a technical rider is a short document that explains all the technical aspects of your band. A basic tech rider has the following information. 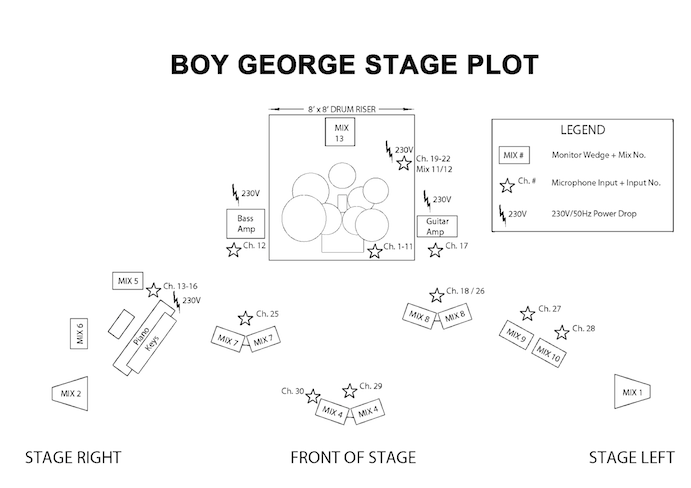 A simple diagram showing where you stand on stage. A list of your instruments and vocalists as well as how many 'channels' each uses. A list of any specific or unusual requirements. Most bands severely underestimate the importance of having a good (and up to date) technical rider. It is a bit like a CV, it tells the sound engineer and tech team a lot about the band and what to expect before you even show up. If you do a poor job with your tech rider, the sound engineer is likely to write you off in advance and not put in the care and effort required to achieve a great sound. It also may mean when you show up at a venue or event you don't have everything you need to put on the best show possible. This causes stress. Stress if not your friend. Being up to date is also important, I have lost track of the number of times I have received what looks like a great tech rider and then spent hours setting up a system to the exact technical specs that have been sent only to have the band turn up with several different instruments, 2 extra singers or a comment such as "where did you get that rider from, its really old, we all go on opposite sides of the stage now". This makes your sound engineer mad. Making your sound engineer mad is never a good idea because they can make or break your performance. An competent and engaged sound engineer can be the difference between a ho hum performance and a standing ovation so never under estimate the importance of making your sound engineer happy. Sending through a poorly written or just plain wrong tech rider will not only make your sound engineer mad but it will also likely cause them to stop caring about your best interests. If your band doesn't care about the technical side of your performance, then why should they? Here are some tips to creating a standout tech rider that makes your tech crew happy and will ensure you have a great gig. Put a date on it, right up the top there and put an expiry date on it stating that if the rider is older than a certain date they should contact you to get an updated version. Put the phone number and email address on it for someone who understands tech stuff. Don't put your booking agents number or your promoter or the number of a flat you used to live at 3 years ago. Promoters and agents don't give a toss about technical things other than how much they cost and when a tech rings these people they are more likely to get the wrong answer to a question. 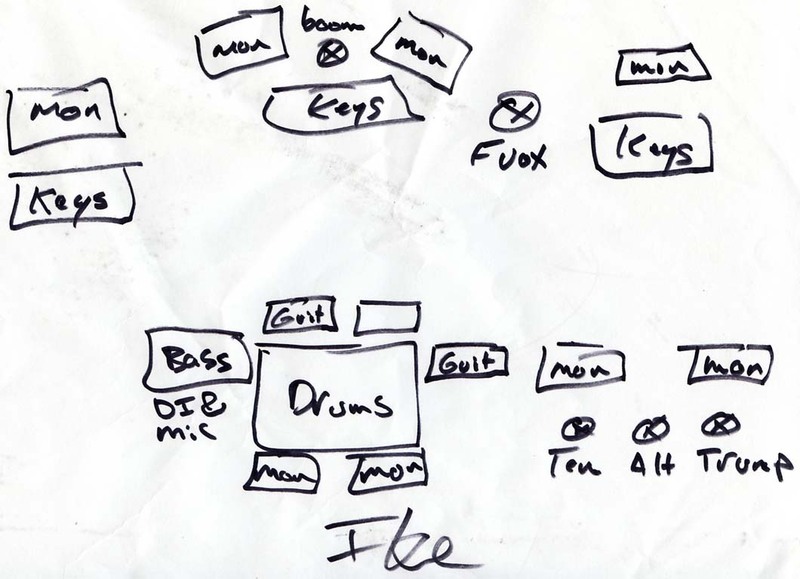 Draw an accurate stage layout and mark on it where vocalists stand, how many monitors you need, what instruments go where. This is important as your tech team will spend a considerable amount of time preparing the stage to ensure you are not tripping over cables and that the stage looks good. Changing things around after its all set up increases the chances of something going wrong and usually ends up being messy. List your instruments and how many channels each use. If you only use two tom drums then state it on the rider. There is nothing worse than having "Drum Kit" written on a rider and then have the drummer turn up with 7 tom drums. This will be a major headache for your tech crew as they will likely have to re-patch the entire mixing console or may not have brought enough microphones. Don't be too demanding, unless you are Iggy Pop you probably shouldn't go too overboard with your requests. If your singer is a douche-bag, then drop a subtle hint that this is the case so that the tech team can be prepared. For example.. "Our lead singer has been known to drink too many bourbons and spill drinks into monitor wedges so we recommend taking precautions". This kind of stuff is highly appreciated as steps can be taken to avoid issues during the show. Clearly state what equipment you are bringing and what equipment you need to be provided. Ambiguity is not good in this section and will result in last minute panic. Finally, when you advance the show, tell the tech team what time you expect to arrive and when you will be available for a sound check. On the day, if you are running late or early, call the tech team to advise this is the case. Techs do not like surprises and they especially don't like getting a call 40 minutes after you were supposed to arrive to tell them that you are running 4 hours later. Here is an example of an international quality rider, obviously yours does not need to be this detailed but it gives a good indication of the level of clarity required in a good rider.